This Cleaved LC3B antibody is generated from rabbits immunized with a KLH conjugated synthetic peptide between 89-122 amino acids from human Cleaved LC3B. 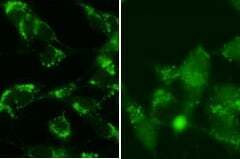 Ubiquitin-like modifier involved in formation of autophagosomal vacuoles (autophagosomes). Plays a role in mitophagy which contributes to regulate mitochondrial quantity and quality by eliminating the mitochondria to a basal level to fulfill cellular energy requirements and preventing excess ROS production. Whereas LC3s are involved in elongation of the phagophore membrane, the GABARAP/GATE-16 subfamily is essential for a later stage in autophagosome maturation. Promotes primary ciliogenesis by removing OFD1 from centriolar satellites via the autophagic pathway. Cytoplasm, cytoskeleton. Endomembrane system; Lipid-anchor. Cytoplasmic vesicle, autophagosome membrane; Lipid-anchor. Note=LC3-II binds to the autophagic membranes Localizes also to discrete punctae along the ciliary axoneme (By similarity). Small volumes of anti-MAP1LC3B antibody vial(s) may occasionally become entrapped in the seal of the product vial during shipment and storage. If necessary, briefly centrifuge the vial on a tabletop centrifuge to dislodge any liquid in the container`s cap. Certain products may require to ship with dry ice and additional dry ice fee may apply. Macroautophagy is the major inducible pathway for the general turnover of cytoplasmic constituents in eukaryotic cells, it is also responsible for the degradation of active cytoplasmic enzymes and organelles during nutrient starvation. Macroautophagy involves the formation of double-membrane bound autophagosomes which enclose the cytoplasmic constituent targeted for degradation in a membrane bound structure, which then fuse with the lysosome (or vacuole) releasing a single-membrane bound autophagic bodies which are then degraded within the lysosome (or vacuole). MAP1A and MAP1B are microtubule-associated proteins which mediate the physical interactions between microtubules and components of the cytoskeleton. These proteins are involved in formation of autophagosomal vacuoles (autophagosomes). MAP1A and MAP1B each consist of a heavy chain subunit and multiple light chain subunits. MAP1LC3b is one of the light chain subunits and can associate with either MAP1A or MAP1B. The precursor molecule is cleaved by APG4B/ATG4B to form the cytosolic form, LC3-I. This is activated by APG7L/ATG7, transferred to ATG3 and conjugated to phospholipid to form the membrane-bound form, LC3-II. 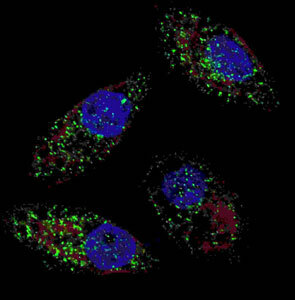 Fluorescent image of U251 cells stained with cleaved LC3B antibody. U251 cells were treated with Chloroquine (50 uM,16h), then fixed with 4% PFA (20 min), permeabilized with Triton X-100 (0.2%, 30 min). Cells were then incubated with MBS9205943 cleaved LC3B primary antibody (1:100, 2 h at room temperature). For secondary antibody, Alexa Fluor 488 conjugated donkey anti-rabbit antibody (green) was used (1:1000, 1h). Nuclei were counterstained with Hoechst 33342 (blue) (10 ug/ml, 5 min). LC3 immunoreactivity is localized to autophagic vacuoles in the cytoplasm of U251 cells. 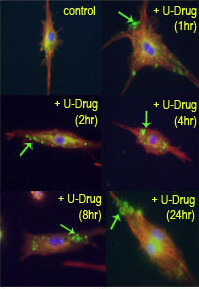 Time course study of mouse leukaemic monocyte macrophage cells treated with U18666A, a drug that causes cholesterol and lipid storage in cells, thereby blocking fusion between late endosomes and lysosomes. Cleaved-LC3 (APG8b) antibody detected punctuate staining indicative of autophagic vacuole or phagosome structures. Data courtesy of Dr. Barry Boland, Department of Pharmacology, Oxford University. SY5Y cells were pretreated with 5nM bafilomycin for 24hr and fixed in methanol (left panel) or 4% of paraformaldehyde (right panel). Treatment with antibody at dilution 1:100. Data courtesy of Jianhui Zhu, MD, PhD & Charleen T. Chu, MD, PhD, University of Pittsburgh School of Medicine. NCBI/Uniprot data below describe general gene information for MAP1LC3B. It may not necessarily be applicable to this product. LC3B: is a ubiquitin-like protein that is a constituent of the ATG8-conjugation system, one of two evolutionarily conserved phosphatidylethanolamine conjugation systems necessary for the formation of the autophagosome. The human ATG8 system includes seven ubiquitin-like light chain proteins (LCPs) that are homologs of yeast LC3: MAP1LC3A, -B, -C, GABARAP, GABARAPL1, -2, and -3. Pro-LCPs are cleaved by ATG4B to expose a C-terminal glycine residue, the cytosolic LCP-I form. The exposed C-terminus is conjugated to the head group amine of phosphatidylethanolamine (PE) through an amide bond by a sequence of ubiquitination-like reactions that involves an E1 (ATG7), an E2 (ATG3), and an E3 (a complex including ATG5, ATG12, and ATG16L). The PE-congugated form (LCP-II) is tightly associated with the autophagosomal membrane. The LCP-II forms can also be delipidated by the ATG4 proteases: most of the LCPs are delipidated and liberated from the membrane before autophagosomes fuse with lysosomes. Interacts at microtubules with CABP1 (via EF-hands 1 and 2) but not with calmodulin. Recruits proteins such as SQSTM1 and NBR1 to the autophagosome. 1. Westermark B.; Pontén J.; Hugosson R. (1973)." Determinants for the establishment of permanent tissue culture lines from human gliomas". Acta Pathol Microbiol Scand A. 81:791-805. [PMID: 4359449]. 2. Pontén, J.,Westermark B. (1978)." Properties of Human Malignant Glioma Cells in Vitro". Medical Biology 56: 184-193. [PMID: 359950]. 3. Geng Y.;Kohli L.; Klocke B.J. ; Roth K.A.(2010). "Chloroquine-induced autophagic vacuole accumulation and cell death in glioma cells is p53 independent". Neuro Oncol. 12(5): 473-481. [ PMID: 20406898].